If you’ve ever been curious about energy facts in your state—such as which sector consumes the most energy, or how your state’s electricity prices compare to the rest of the country—the State Portal hosted by the U.S. Energy Information Administration (EIA) is a convenient, user-friendly resource. EIA’s portal compares energy in the 50 states from EcoWest on Vimeo. In a previous EcoWest post, we highlighted another useful data visualization tool, Saxum’s United States of Energy map, which illustrates energy production and known fuel deposits around the country. The EIA web portal offers an interactive tool with state-level energy data and detailed profiles for each state. It also aggregates data on state rankings of energy consumption, production, and prices across sectors and fuel types. Users can create customized energy infrastructure maps, visualize state-level data by generating graphics and charts, and analyze key energy statistics for each state. 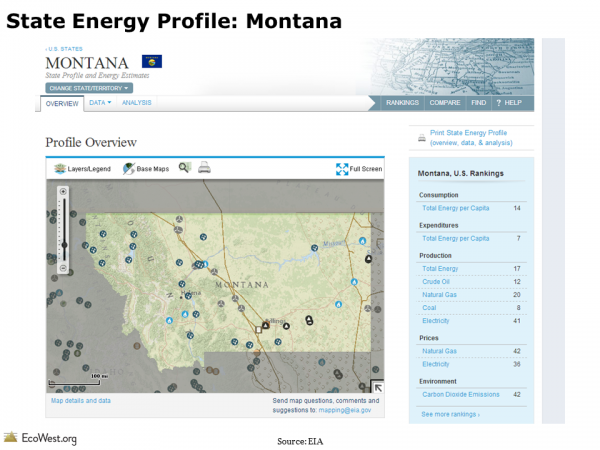 In this post, we’ll use the state of Montana as an example to highlight the range of information that the EIA portal provides. From the main landing page, you can select Montana to display the state’s profile overview. Under the “Layers/Legend” menu item, you can choose from over 30 infrastructure layers, including coal plants, hydroelectric plants, natural gas pipelines, transmission lines, and LNG export terminals. Below are five outputs from the portal that we found especially useful. For easy reference, the portal provides a chart on the state profile page to indicate how that state ranks against all other U.S. states in terms of energy consumption, production, pricing, expenditures, and emissions. As you can see from the screenshot below, Montana is the country’s eighth largest producer of coal. The state emits a relatively low level of carbon dioxide, mostly owing to its sparse population. 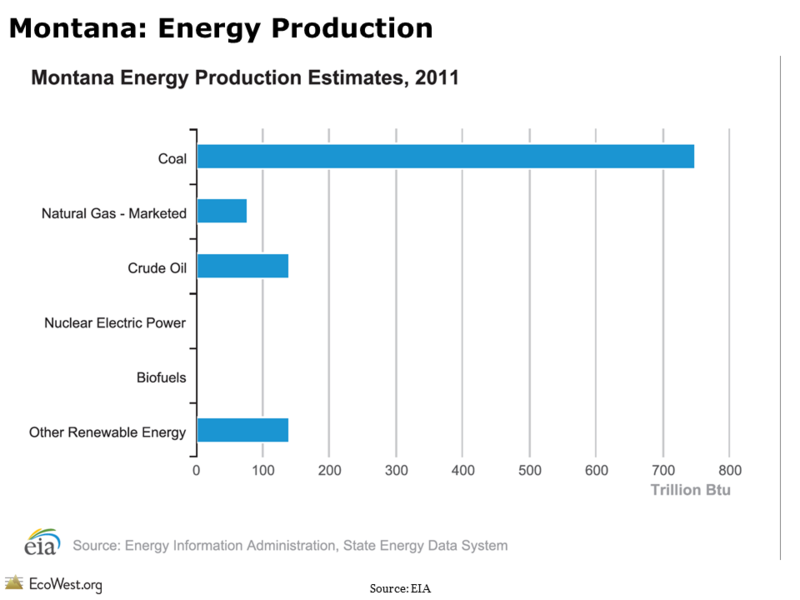 As shown in chart below, coal dominates energy production in Montana. The state is home to the country’s largest estimated recoverable coal reserves. Roughly one-quarter of the coal mined in Montana is consumed in-state for electric power; two-fifths is distributed domestically to more than 15 states; and one-third is exported, mainly to Asia. 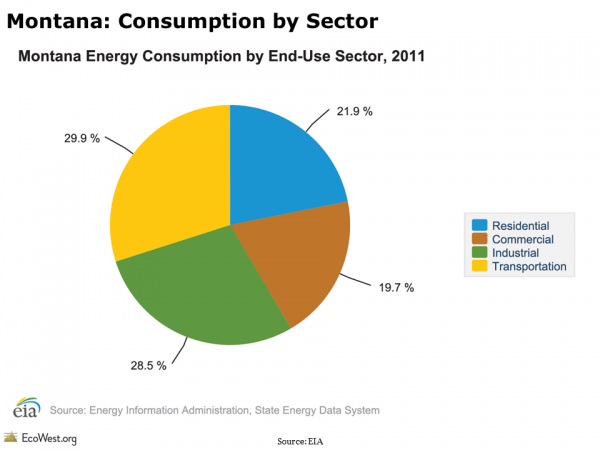 You can also view the breakdown of energy consumption by sector for each state. In Montana, the transportation and industrial sectors account for roughly three-fifths of energy use. At the national level, the industrial and transportation sectors are also the leading energy users. 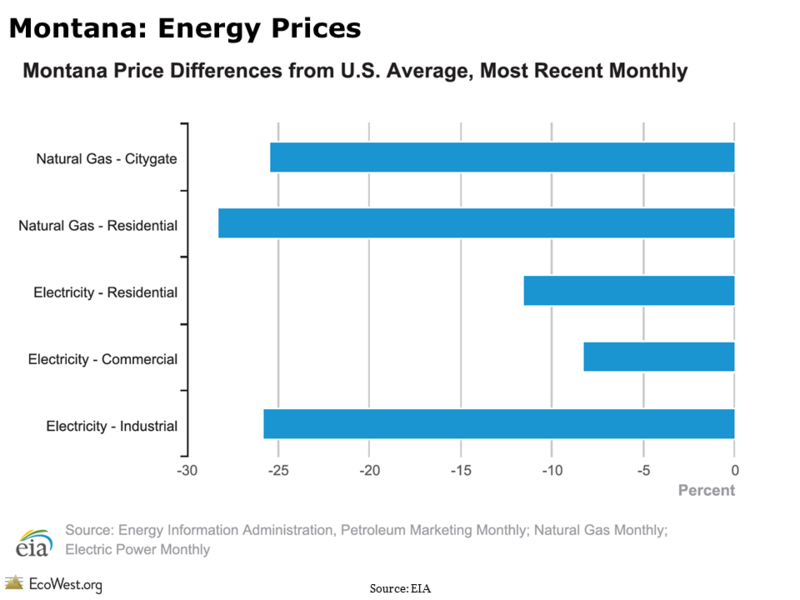 It’s also interesting to compare how energy prices in your state stack up against other states. In Montana, energy prices are about 25 percent lower than the national average. These low prices are primarily a result of a stable supply of energy produced in-state and a relatively low demand from the state’s comparatively small population. 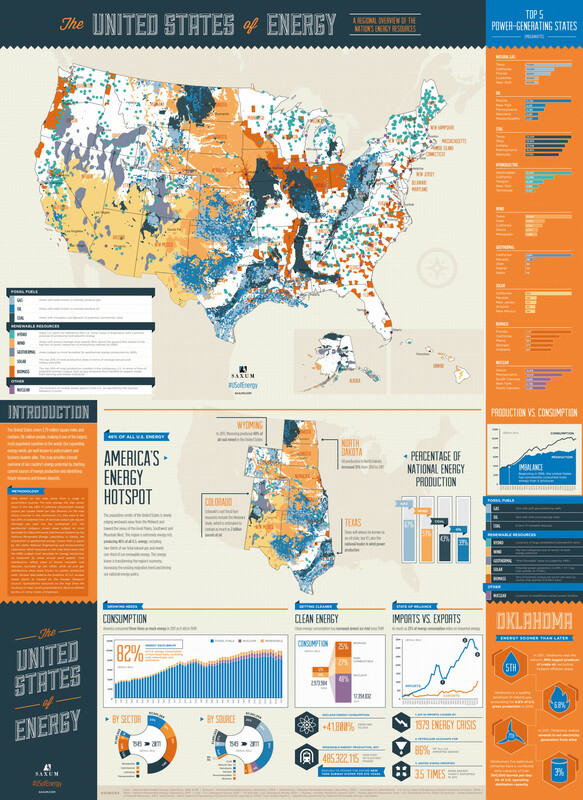 Montana is well-situated, geographically speaking, for renewable energy production. The state has significant hydroelectric potential from rivers flowing out of the Rocky Mountains. And across its wide plains, the state has the third highest commercial wind potential in the country. 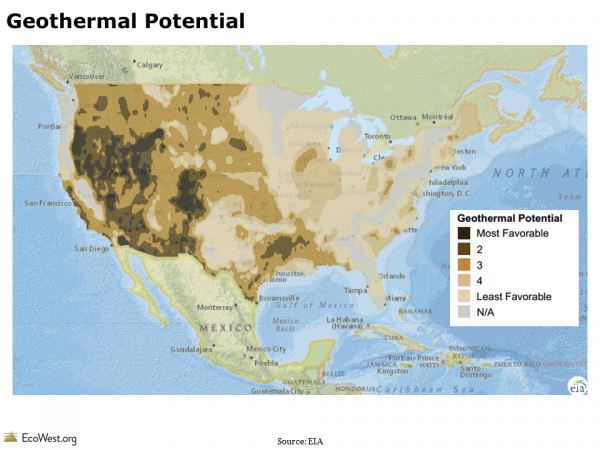 On the EIA state portal, you can map renewable energy potential by source across the country. As this map shows, Montana has significant geothermal potential, particularly in the state’s mountainous southwest corner. Currently, geothermal resources are largely untapped as an electricity source in Montana, a fact which many attribute to the state’s low fossil fuel energy prices, small population, and lack of transmission infrastructure in remote locations. Given its frequency of updates and user-friendly format, the EIA portal is a handy resource for academics, decision-makers, and residents who are keen to learn more about their state’s energy portfolio. Take a tour of the portal and let us know what you learn about your state. EIA’s state energy portal provides state-level energy data and infrastructure overlays for all 50 U.S. states. 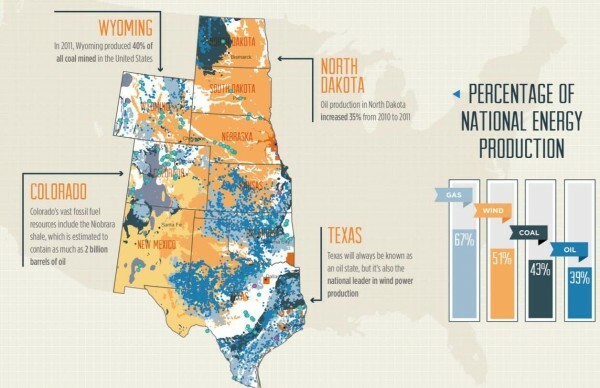 Maps of our nation’s energy potential usually display just one source, such as the location of wind farms or the extent of natural gas fields. In an interesting new data visualization, advertising and PR firm Saxum has combined both fossil and renewable energy resources into a map of The United States of Energy. Below are the front and back of the viz, which has so much info that it probably reads best in hard copy (click on images to enlarge). What began as a simple graphic showcasing America’s energy riches quickly grew into a two-sided, folded map concept displaying thousands of individual data points. 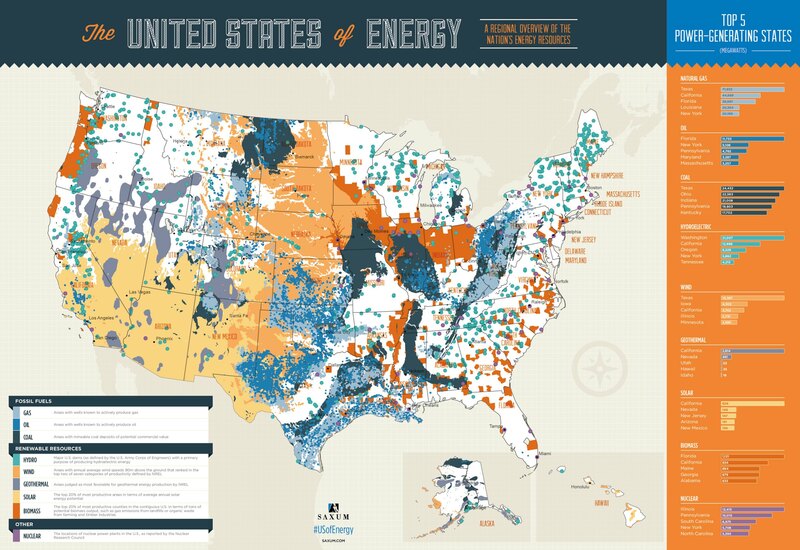 The #USofEnergy map visualizes our country’s energy potential by charting current sources of energy production and identifying future resources and known deposits. Energy resources surveyed include: natural gas, oil, coal, nuclear, hydroelectric, wind, geothermal, solar and biomass. We compiled the data from a broad range of industry and government sources, including the National Renewable Energy Laboratory, U.S. Geological Survey, U.S. Energy Information Administration, U.S. Army Corps of Engineers, Nuclear Research Council and American Wind Energy Association. In some parts of the country, such as the nation’s midsection, there are so many different energy sources being exploited that the map is tough to make out. Overlapping layers present a difficulty here, but in other regions, such as the East Coast, there’s a lot of white space. Saxum, which describes itself as “one of the leading integrated marketing communications agencies in the Great Plains,” highlights that 46 percent of U.S. energy is produced by nine states in the center of the country, as shown below. It’s worth zooming in to their legend to see what all these layers really mean. With biomass, for example, an entire county is shaded orange if it’s in the top-20 percent for producing energy in this way per square kilometer. With solar, only the best places in the country are shown. Here in Denver, for example, we’re not covered by the solar layer, but photovoltaic panels on the roof of my home/office generate the majority of electricity we consume (see this more detailed solar potential map from the U.S. Department of Energy). Emily Guerin at High Country News has a good overview of the other trends that Saxum highlights in its map. If you’re looking for maps of individual energy sources, check out our PowerPoint presentation on land use. The United States emits around 5.6 billion metric tons of carbon dioxide equivalent (CO2e) each year. That’s roughly the annual CO2 exhaust of 1.2 billion cars, according to the U.S. EPA’s Greenhouse Gas (GHG) equivalency calculator, and it’s nearly 20 percent of annual global GHG emissions. 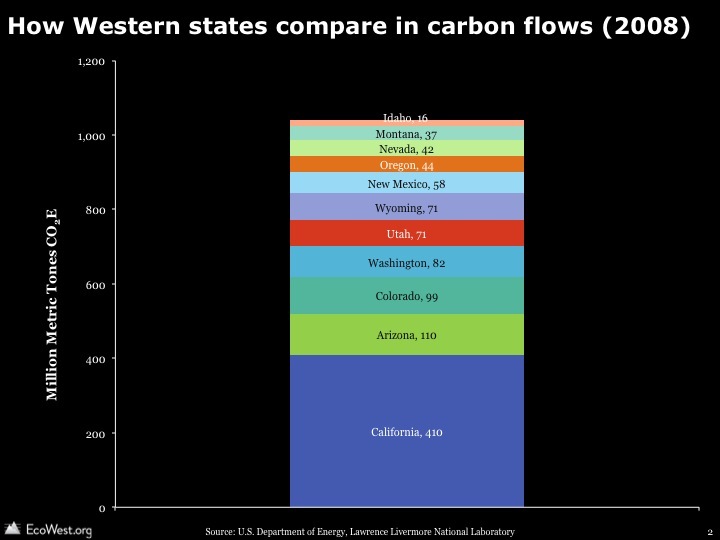 U.S. and Western carbon flow diagrams from EcoWest on Vimeo. Flow diagrams from the Lawrence Livermore National Laboratory provide informative visual summaries of the nation’s carbon emissions from generation to end use. These graphics, also known as Sankey diagrams, show how many GHGs originate from the burning of fuels and how many GHGs are attributable to different economic sectors. Think of the left side of the flow as the supply side, and the right as the demand side. In this deck, I’ve also compiled slides representing GHG emissions in the 11 Western states, which show some interesting patterns in GHG emissions from origin to end use. Data on GHG emissions is only available at the national level. To understand state-by-state differences, Lawrence Livermore uses state-level energy use data to estimate the flow of GHGs. The U.S. Department of Energy’s Energy Information Administration compiles such energy use data in the State Energy Data System (SEDS). California, Idaho, Oregon, and Washington are less coal-dependent and more petroleum dependent. Natural gas accounts for a higher portion of carbon emissions in states like Nevada and Oregon. Petroleum accounts for a lower portion of carbon emissions in Colorado and Wyoming. Comparing Washington to Wyoming demonstrates how end use differs by state. Energy generation accounts for the bulk of carbon emissions in Wyoming, but the transportation and industrial sectors dominate in Washington. Wyoming is a major energy exporter to other states, while Washington relies heavily on hydropower, which does is essentially carbon-free. When examining these slides, it’s important to remember that the size of the rectangles and the lines between them are not comparable from state to state. They show, within a state, where GHGs originate and terminate in various uses. Lawrence Livermore also produces similar graphics for energy and water, and in another post, we provide a little background on Sankey diagrams, which are great tools for visualizing how commodities flow through systems.